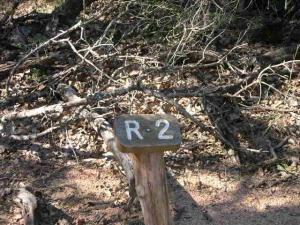 I hiked portions of the Ridge, Riverside, and Pine Ridge trails, totaling about 3.5 miles. Very nice view of the Colorado River. Some parts of the Pine Ridge trail were of moderate difficulty, but steps cut into the ascents were very helpful. My hike about the nature trail took about 45 minutes, plus another 15 minutes to get back to the starting point along the trail that loops around the park. I'd like to have a nature guide that would identify fauna; otherwise it was a pleasant walk. My wife and I hiked the granite based trail around the park, and we moseyed along about a mile of the nature trail. It was pleasant enough, but the park is crowded with soccer players on the weekends, so there was little solitude. But we enjoyed the afternoon, watched some of the games and the train. Very nice park and trail. Ethel and I walked opposite directions, so we wouldn't have to double back. Only met a few people. There was a construction "zone" near the road at about marker 9, so I had to wait at the yellow tape for a couple of minutes to let a front-end loader get out of the way. We'll go back there again soon and I'll get some photos.